Background: Nowadays one of the principal challenges of any country is improving the chronic disease and cancers. One of the most important of cancers is esophageal cancer in Iran. No doubt, esophageal cancer is an outcome of the interaction and combination of different factors. Cancer of the esophagus is one of the most common causes of death in adults (especially women) in Iran, where the incidence of this cancer is among the highest in the world. Objective: The main aim of this cross-sectional study was to test the hypothesis that food insecurity could create esophageal cancer among women in Iran (Zanjan Province). Methods: The method of this paper has been based on the analytical and descriptive research using fuzzy cognitive maps (FCMs) method. The subjects were 580 women aged 40–70 years (150 women have esophageal cancer), and they are selected randomly in the Zanjan Province of Iran. Results: The food insecurity (such as hunger and hidden hunger) in the Zanjan Province, according to the 24 h food-recall questionnaire was 23% and 38%, respectively. Only 39% of the study population was secure in terms of having access to all key nutrients. The accuracy of the questionnaire for screening for hunger in the population was 88.78%, respectively, and the corresponding value for hidden hunger was 83.4%. The average value of esophageal cancer predicted using fuzzy cognitive maps is equal to 75.43% (for 36 months). Conclusion: Our findings showed an association of food insecurity and body mass index (BMI) in the study population. Food insecurity increased the rate of underweight and decreased the rates of overweight and obesity. Women esophageal cancer usually begins in the cells that line the inside of the esophagus. Women esophageal cancer can occur anywhere along the esophagus, but in people in Iran (especially the Zanjan Province), it occurs most often in the lower portion of the esophagus. More men than women get esophageal cancer. The most common types of esophageal cancer are squamous cell carcinoma and adenocarcinoma. Squamous cell carcinoma begins in flat cells lining the esophagus. Adenocarcinoma begins in cells that make and release mucus and other fluids. Food insecurity and smoking increase the risk of esophageal squamous cell carcinoma. Gastroesophageal reflux disease and Barrett's esophagus may increase the risk of esophageal adenocarcinoma. In this paper, it is focused on the food insecurity and its effects on the women esophageal cancer. One of the main factors is food insecurity; there is evidence that food insecurity, particularly transitory food insecurity, has been getting worse in Malawi. During 2001–2003, it suffered a food crisis. This was manifested in a 6-fold increase in food prices, which left around 3.5 million people food insecure. The crisis was the combined result of climatic shocks, mismanagement or misdirection of the country's strategic grain reserve, poor crop estimates, and a chaotic delayed response in terms of maize imports. Few universally valid indicators of food security are applicable in crises. Nutritional status, if properly measured, is widely accepted as comparable across different contexts., However, while nutritional status can be one indicator of food security status, it may equally reflect elements of health status, care practices, water quality, and other determinants of nutrition., According to literature, food insecurity is a major factor to creating esophageal cancer in Iran. With this in mind, the objective of this cross-sectional study was to test the hypothesis that food insecurity could create esophageal cancer among women in Iran (Zanjan Province). The method of this paper has been based on the analytical and descriptive research using fuzzy cognitive maps (FCMs) method. This analytical and descriptive type research has been carried out using the questionnaire as the research tool for gathering the required data. Data gathering involved both reference material and a questionnaire survey. Sampling was a simple random sampling, and the data-gathering instrument was the questionnaire. The author had already undertaken research in this field, which had stimulated the prediction techniques used to analyze this case study, based on the FCM method. Information on food consumption was obtained with a validated 24 h food-recall questionnaire over 3 nonconsecutive days. These results were compared with data from the Household Food Security Scale to assess the applicability of this short scale for the surveillance of food insecurity., The short questionnaire had six questions. If the participants responded to two or more of the six items, they were considered food insecure. The questions were validated (in the local language) by a pilot study before starting the main research. To do this, the questionnaire was distributed to fifty individuals with the same characteristics and from the same area as the main study participants. The pilot study was carried out on the first fifty subjects of the whole study group. After the assessment and evaluation of the results of this pilot, the next individuals were studied as the main part of the research. The results were then statistically analyzed to ensure that the short-scale questionnaire was valid for assessing household food insecurity in the main part of the research. For prediction, the FCM method was employed. 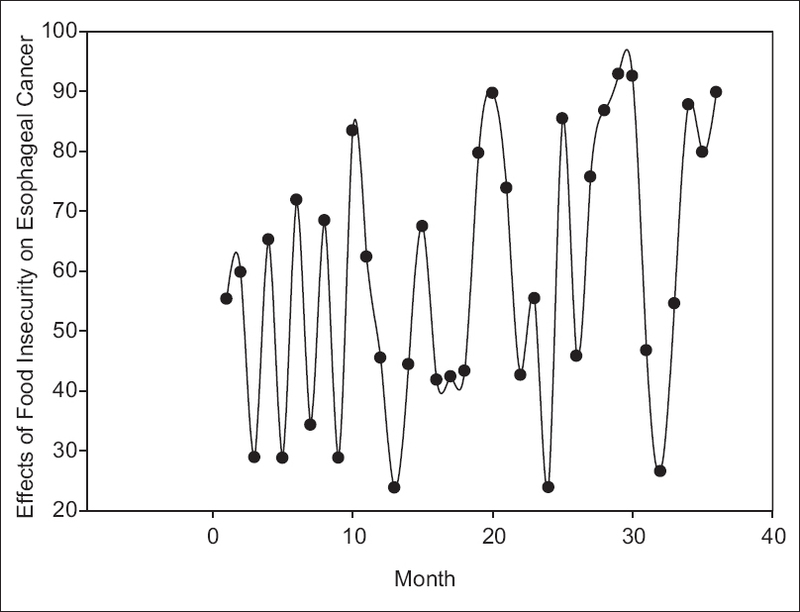 Predicting the time series for recognizing the numerical or explanatory levels is a new approach. This approach has been presented using the FCMs together with a learning method enjoying the advantage of the real-coded genetic algorithm. In FCMs framework, the systems are described through their reciprocal concepts and relationships., The suggested prediction method combines the FCMs with the fuzzy set grain model, one of the advantages of which being the modeling and predicting in two numerical and explanatory levels. Comprehensive activities have been performed in mind considering two main goals. First, estimating the quality of the suggested structure and second, testing the effects of the prediction technique parameters on the prediction quality. The gained results in comparison with other fuzzy-based prediction techniques show that the suggested structure produces higher accuracy in numerical and explanatory levels. Application of the FCMs for predicting the time series: The motive for using this specific technique is a result of its simple and comprehensive structure, consisting of the reciprocal relationship concepts, conforming to a given range. The FCMs are capable of acquiring the behavior of a given dynamic system. Recently, the introduced genetic optimization-based learning algorithm (genetic algorithm) allows for automatic expanding of the FCMs from the genetic data. This learning approach is flexible considering the input data. For example, both observations in successful time points of t and t + 1 can be used for learning the map, and if some observations are removed from the historical data, all the remained couples still can be successfully used for learning. The possibility of design and expanding the absolute predicting systems based on the FCMs which are capable of predicting in two numerical and explanatory levels. The FCMs prediction system realizes a series of well-delineated steps. The input signal is preprocessed in a preprocessing module, which plays a dual role. First, it extracts feature (s) of interest for the linguistic prediction. They include change of signal, which is defined as a difference between two consecutive values of a given input signal and the signal's amplitude. The change constitutes an additional time series. Second, both signals are normalized linearly to the unit interval. To avoid artificial enlargements of small signal changes, the normalization of change signal is carried out based on the range of the original time-series signal. More specifically, the maximum possible change value is determined, and the normalization is performed with respect to this value. As a result, from the preprocessing module, two normalized signals, i.e., input and change, are obtained. The first value of input signal is dismissed to have equal length of both signals. After preprocessing, information granules of the signal determining its current status are extracted and linked in fuzzification module. This process involves linguistic descriptors (labels), which are given as a set of fuzzy sets. Based on their definitions, membershiP values are calculated for each value of both signals. The linguistic descriptors can be defined uniformly or independently for each signal. Consider K time series as an input to this module and number of corresponding linguistic descriptors denoted by the N1, N2,…, Nk. In the first phase, these signals are represented in terms of membershiP values of given fuzzy sets, which results in having N1 + N2+… +Nk fuzzy time series. Next, granularization process takes place, which links fuzzy time series with the use of fuzzy operators. Each of these time series expresses the level the given signal can be characterized by corresponding linguistic descriptors. We provide unique linguistic labels over the entire time series by choosing the descriptors with the highest values at each time point. In particular, it serves for experimental evaluation of the prediction method dividing the input dataset into training and test subsets. The former subset is used to develop appropriate FCMs, whereas the latter one is separate and is used to test prediction accuracy on unseen data. The actual learning of FCMs is performed in the real-coded genetic algorithm module, which establishes FCMs based on training data. This process exploits the genetic learning algorithm, which is described in “Materials and Methods” section. A number of nodes in candidate FCMs correspond to a number of granular time series from the output of fuzzification module. The nodes depict complete signal description within the assumed fuzzy domain, i.e., each node corresponds to a single combination of linguistic descriptors of granular time series. We emphasize that all FCMs parameters that define the model are established automatically, i.e., without any substantial intervention of a model's designer. A fully developed FCM is used by linguistic prediction module to carry out the signal prediction in the fuzzy domain (linguistic prediction) on the test data. This process involves a model simulation according to scenario defined in data divider module. Linguistic prediction uses fuzzy operations on granular time series obtained from simulation. Numerical prediction requires fuzzy values to be defuzzified. Defuzzification module performs this process according to a predefined defuzzification method on granular time series, which is obtained from simulation and then is carried out on the test data. The numerical prediction is performed based on the defuzzified values. In addition to defuzzified signal value, other signal features defined in the preprocessing module may be also used as a supplement, or correction coefficient, during prediction. First, it presents the descriptive analysis of research data.The subjects were 580 women aged 40–70 years (150 women has esophageal cancer), they are selected randomly in the Zanjan Province of Iran. The food insecurity (such as hunger and hidden hunger) in the province according to the 24 h food-recall questionnaire was 23% and 38%, respectively. Only 39% of the study population was secure in terms of having access to all key nutrients. The accuracy of the questionnaire for screening for hunger in the population was 88.78%, respectively, and the corresponding value for hidden hunger was 83.4%. An average value of esophageal cancer predicted using FCMs is equal to 75.43% (for 36 months). Participants were required to sign an informed consent to participate in the program. Approval for this study was obtained from the Research Committee of the Food and Nutrition Security Office of the Islamic Azad University (Medical Sciences section). The area has previously been selected and described in detail as a reliable representative sample of the general population in terms of socioeconomic status, lifestyle, general health status, and population composition. Second, an optimized signal was exploited for prediction from among the 4 signals (40–47, 48–55, 56–63, and 64–70 years). The signal with minimum change standard deviation and maximum range standard deviation will be selected. Domain is obtained by change is obtained by . According to that the signal of 64–70 years has the minimum change standard deviation and the maximum range standard deviation and therefore is selected as the input signal of the prediction. Real-coded genetic algorithm learning parameters (whose values have been established experimentally) include the following: (1) Single-point crossover; (2) mutation method: Randomly chosen from random mutation, nonuniform mutation, and Mühlenbein's mutation; (3) selection method: Randomly chosen from roulette wheel and tournament; (4) probability of recombination: 0.9; (5) probability of mutation: 0.5; (6) population size: 100 chromosomes; (7) maximum number of generations: 10 000; and (8) maximum fitness function value: 0.999. After a candidate FCM is constructed from the training data by the real-coded genetic algorithm module, the prediction is carried out at two levels, linguistic and numerical. [Figure 1] presents predictions in 36 months in future. According to the prediction data, the mean square error reached its minimum value using the above function: 0.094. The R2 value reached to 76.8% which indicates the model validity. The Cronbach's alpha value is 81.3%, confirming the validity of the model. In addition, interviews with the experts based on the Delphi method confirmed the above values in 74.6% of the cases. The subjects were 580 women aged 40–70 years (150 women has esophageal cancer), they are selected randomly in the Zanjan Province of Iran. The food insecurity (such as hunger and hidden hunger) in the province according to the 24 h food-recall questionnaire was 23% and 38%, respectively. Only 39% of the study population was secure in terms of having access to all key nutrients. The accuracy of the questionnaire for screening for hunger in the population was 88.78%, respectively, and the corresponding value for hidden hunger was 83.4%. The average value of esophageal cancer predicted using FCMs is equal to 75.43% (for 36 months). The food insecurity (such as hunger and hidden hunger) in the province according to the 24 h food-recall questionnaire was 29.8% and 46.2%, respectively. In addition, food insecurity significantly increased the risk of underweight in the study subjects (relative risk [RR] = 53.2, confidence interval [CI]: 4.9–65.5), while it decreased the risk of overweight and obesity (RR = 0.30, CI: 0.18–0.49 and RR = 0.32, CI: 0.16–0.62, respectively). The prevalence rates of hunger and hidden hunger according to the 24 h food-recall questionnaire were 11% (CI: 40–47), 18% (48–55), 28% (56–63), and 43% (CI: 64–70), respectively. Only 27% (CI: 40–58) of the study population was secure in terms of having access to all key nutrients (including protein, calcium, Vitamin A, and Vitamin B2). Of the total respondents, 40% reported that they could not afford to eat balanced meals. At the same time, 28% of the respondents gave affirmative responses to two or more of the six items, indicating food insecurity. The accuracy of the questionnaire for screening for hunger in the population was 93.3%, respectively; and the corresponding value for hidden hunger was 87.6%. The results gained from the suggested method in comparison with the results of the other methods showed that the prediction methods based on the existing fuzzy sets had been tested only on one or two data sets. On the contrary, our paper includes comprehensive tests and comparing the results with all the rival methods, as shown in [Table 1]. [Table 1] makes a comparison between the results of the predicting data relating to 36 months based on the error level. As can be seen from the results, the FCMs method incurs the minimum error possible. One possible follow-up is the comparison of the proposed method with other models, such as the Hidden-Markov models and Bayesian network. Carlson SJ, Andrews MS, Bickel GW. Measuring food insecurity and hunger in the United States: Development of a national benchmark measure and prevalence estimates. J Nutr 1999;129 2S Suppl: 510S-6S. Kendall A, Olson CM, Frongillo EA Jr. Relationship of hunger and food insecurity to food availability and consumption. J Am Diet Assoc 1996;96:1019-24. Alaimo K, Briefel RR, Frongillo EA Jr., Olson CM. Food insufficiency exists in the United States: Results from the third National Health and Nutrition Examination Survey (NHANES III). Am J Public Health 1998;88:419-26. Qasemi H. Food security programme in Islamic Republic of Iran. Vol. 12. Tehran: Institute of Food and Nutrition Research; 1998. p. 121-3. Shoa NZ. Validity of Radimer-Cornell Questionnaire in Tehran. MSc Thesis, Tehran Shahid Beheshti University of Medical Sciences. Vol. 12; 2003. p. 1234-50. Hamilton WL, Cook JT, Thompson WW, Buron LF, Frongillo EA Jr., Olson CM, et al. Household food security in the United States in 1995: Summary report of the food security measurement project. Vol. 2. Alexandria, VA, USA: US Department of Agriculture, Food and Consumer Service; 1997. p. 124-47. Gulliford MC, Mahabir D, Rocke B. Food insecurity, food choices, and body mass index in adults: Nutrition transition in Trinidad and Tobago. Int J Epidemiol 2003;32:508-16. Kaiser LL, Townsend MS, Melgar-Quiñonez HR, Fujii ML, Crawford PB. Choice of instrument influences relations between food insecurity and obesity in Latino women. Am J Clin Nutr 2004;80:1372-8. Bickel G, Nord M, Price C, Hamilton W, Cook J. Measuring food security in the United States. Guide to measuring food security. Revised 2000. Vol. 15. Washington, DC: US Department of Agriculture, Food and Nutrition Service; 2000. p. 233-48. Campbell CC. Food insecurity: A nutritional outcome or a predictor variable? J Nutr 1991;121:408-15. Coates J, Frongillo EA, Rogers BL, Webb P, Wilde PE, Houser R. Commonalities in the experience of household food insecurity across cultures: What are measures missing? J Nutr 2006;136:1438S-48S. Webb P, Coates J, Frongillo EA, Rogers BL, Swindale A, Bilinsky P. Measuring household food insecurity: Why it's so important and yet so difficult to do. J Nutr 2006;136:1404S-8S. Swindale A, Bilinsky P. Development of a universally applicable household food insecurity measurement tool: Process, current status, and outstanding issues. J Nutr 2006;136:1449S-52S. Asadabadi R. Population and health survey. Tabriz Med J 2003;59:115-20. Blumberg SJ, Bialostosky K, Hamilton WL, Briefel RR. The effectiveness of a short form of the Household Food Security Scale. Am J Public Health 1999;89:1231-4. Gulliford MC, Nunes C, Rocke B. The 18 household food security survey items provide valid food security classifications for adults and children in the Caribbean. BMC Public Health 2006;6:26. Radimer KL, Olson CM, Campbell CC. Development of indicators to assess hunger. J Nutr 1990;120 Suppl 11:1544-8. Laquatra I. Nutrition for weight management. In: Mahan K, Escot-Stump S, editors. Krause's Food, Nutrition and Diet Therapy. 11th ed., Vol. 12. Philadelphia, PA, USA: Saunders; 2004. p. 2545-65. Gulliford MC, Mahabir D, Rocke B. Reliability and validity of a short form household food security scale in a Caribbean community. BMC Public Health 2004;4:22. Sarlio-Lähteenkorva S, Lahelma E. Food insecurity is associated with past and present economic disadvantage and body mass index. J Nutr 2001;131:2880-4. Townsend MS, Peerson J, Love B, Achterberg C, Murphy SP. Food insecurity is positively related to overweight in women. J Nutr 2001;131:1738-45. Olson CM. Nutrition and health outcomes associated with food insecurity and hunger. J Nutr 1999;129 2S Suppl: 521S-4S. Frongillo EA, Olson CM, Rauschenbach BA, Kendall A. Nutrition consequences of food insecurity in a rural New York State County. Institute for Research on Poverty Discussion. Vol. 12. Madison, WI, USA: University of Wisconsin; 1997. p. 21120-97. Song H, Miao C, Roel W, Shen Z, Catthoor F. Implementation of fuzzy cognitive maps based on fuzzy neural network and application in prediction of time series. IEEE Transactions on Fuzzy Systems 2010;18:2233-50.